Weight - 454g. Unglazed candies of oblong rectangular form. Consist of milky toffee with sugary crus..
Purchase Imported Russian Chocolates "Ptichye Moloko" Real from Russian table companyMany people thi..
Buy the Imported Russian Candies Batonchik "Rot Front" 1 lbBatonchik “Rot Front” is a Russian candy .. 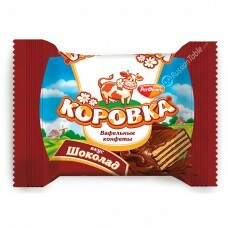 Imported Russian Chocolates Romashka 1 lb: best chocolate in the worldMany times you are unable to g.. Weight - 454gr. Praline chocolate candies Praline with crushed peanut and grated cashew. Hazelnut o.. Weight - 454gr. Praline chocolate candies Praline with grated peanut, vanilla aroma. ..
Lollipop caramels with pleasant barberry sourness. Weight - 454gr .. Weight: 300 g Wheat flour, sugar, palm oil, milk powder, vegetable oil, dry egg powder, cocoa powder..
Chocolate glazed caramels with creamy filling. Contains alcohol. Weight - 1 lb ..
"Tradition caramel ""Rakovye Sheiki"" (Lobsters' Necks)." Sugar,syrop,cocoa mass,nut kernel mass,coc..
Lollipop caramels with ripe duchesse pear taste. Weight - 454gr .. Weight: 300gr Wheat flour, sugar, palm oil, milk powder, vegetable oil, dry egg powder, cocoa powder.. Weight - 454gr. Aerated souffle with chocolate flavor. .. Weight: 150gr. Wheat flour, sugar, palm oil, milk powder, vegetable oil, dry egg powder, cocoa powde.. Weight: 200gr. Korovka often visits her friends. She always takes with her the assorted crispy wafer.. Weight - 454gr. Chocolate candies with creamy filling. .. Weight - 454gr. Chocolate candies. A praline with grated peanut, cocoa-powder and chopped wafers. ..
454gr. Cranberry, black currant and apple flavors. ..
Glazed wafer candy with filling between milk-flavored wafer layers. Weight - 454gr .. Weight - 454gr. Praline chocolate candies Praline with crushed peanut. Hazelnut on the top of a dom..
Caramel with buttery-sugar filling. Weight - 454gr ..
200gr. Soft biscuit roll with creame filling "Birds Milk" (Ptiche moloko). .. Weight - 454gr. Chocolate candies with taffy filling. ..
Glazed wafer candy with filling between chocolate-flavored wafer layers. Weight - 454gr .. Weight - 320 g. chocolate cover, (sugar, cocoa butter, cocoa mass, cocoa powder, flavoring agent ide..
454gr. Jello candies with chocolate glaze .. Weight - 454gr. Glazed candy with chocolate body and cookie crusts .. Weight - 454gr/1 lb .. Under crispy caramel layer - flavored fruity filling. Weight - 454gr / 1lb Sugar,syrop,caramel mass,.. Weight - 454gr. Chocolate candies with filling Nut praline from selected almonds between layers of w.. Caramels with lemon-apple filling and lemon aroma. Weight - 454gr Ingredients: Sugar, treacle, mix o.. Caramels "Teatralnaya" (Theatrical) 1 lb." Weight: 350gr. Cake for 8 portions .. Weight - 454gr. Chocolate candies with filling between wafer layers. Praline filling with coconut o..
Fruit filling with ripe cherry taste. Weight - 454gr .. Weight - 454gr. Chocolate candy on the base of boiled condensed milk. .. Weight - 225 g .. Weight: 454gr/1lb. Milky Body Unglazed Candies .. Weight: 454gr/1lb. Wafer candies with creamy chocolate filling. .. Weight - 200 gr. Assorted chocolates set with creamy fillings for every taste. .. Weight: 454gr / 1lbCaramel with milky filling with baked milk flavor ..
Candies based on cocoa products with walnut flavoured praline filling. Net weight 1 lb Sugar,cocoa p.. Weight: 454gr (1lb). Jello candies with chocolate glaze..
365 g. chocolate cover, (sugar, cocoa butter, cocoa mass, cocoa powder, flavoring agent identical to..